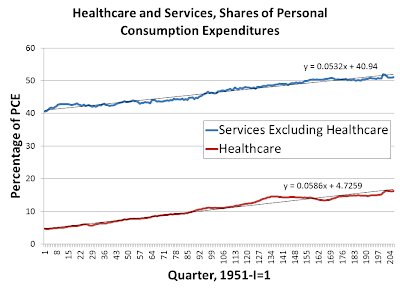 What's the Big Deal with Healthcare Spending? I'm always a little disappointed by the shallowness of the coverage of the healthcare debate in the media. Every media outlet takes it as a given that the measure of the success of healthcare proposals is whether it "controls costs," by which they mean that it decreases spending on healthcare. 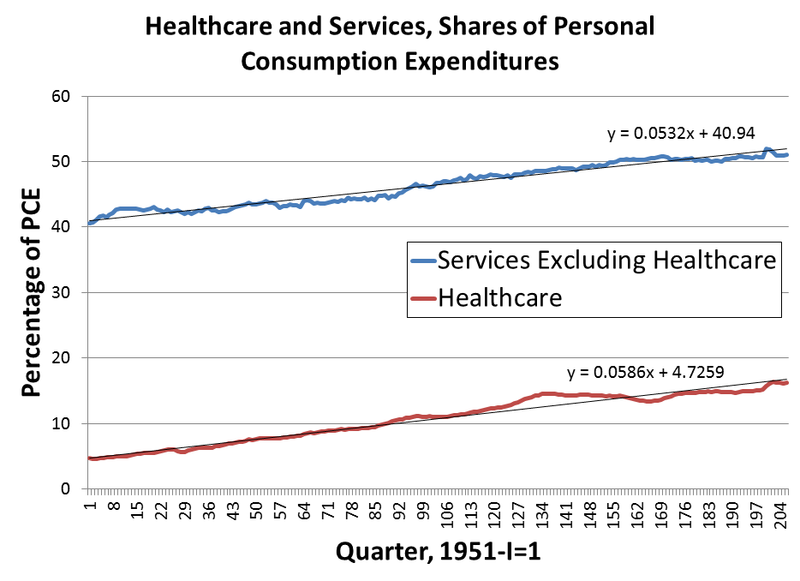 I included the linear trend equations because without actually doing the math, its impossible to see from the data that healthcare spending is actually growing slightly faster than spending on services other than healthcare. And that is exactly my point: there is almost no difference between the two. It makes little difference, then, to complain about healthcare spending overall, as I see it. It primarily reflects the fact that we are wealthier and choose to spend that wealth on making ourselves healthier. There is nothing wrong with that. This is not something that needs to be stopped. Notice the massive fluctuations in total employment growth, while employment in healthcare almost never falls, even in recessions. So far, all the data says that we ought to like the fact that the healthcare sector is growing, not fear it. To me, that looks like a relatively small problem. But then, it is really just a matter of opinion as to whether this increase in the relative price of healthcare is a big problem. At any rate, none of the proposals to "reform" healthcare--including both Obamacare and Ryancare--really address the issue. The obvious solution to graphs like these is to institute measures to expand the supply of healthcare, which will reduce the price as we slide down the demand curve. But all of the proposals to reform healthcare--democrat and republican alike--rely on supressing demand rather than expanding supply, which will lower price by decreasing access to healthcare. They are all based on the erroneous premise that healthcare's rising share of GDP is a bad thing. But wouldn't it be far better to lower prices by increasing access to healthcare? And Sarah Kliff has an excellent idea that will do exactly that.